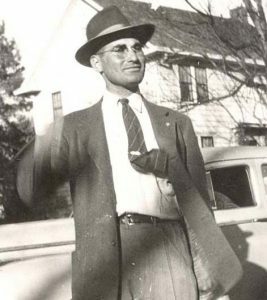 Sam Goldstein was part of a successful retail business in Lincoln, Nebraska, during the 1920s. The effects of the Great Depression, however, caused their company to fail in 1933. At age 47, with a wife and five children to support, Sam’s one financial asset was a life insurance policy with a cash value of $800. In his younger years, Sam had been involved in buying and selling animal hides and furs, along with a trade called “junk dealing.” Today we would call it recycling. With the encouragement of a family friend, Sam decided to cash in his insurance policy. He purchased a 1927 Nash car, said goodbye to his family in Lincoln, and boldly headed south into Kansas in hopes of buying wool and hides to sell in Kansas City. The car broke down just north of Manhattan, Kansas. A local rancher not only towed his car into town for repairs, but also sold him his first two bags of wool. The rancher and the repair shop owner persuaded Sam to set up his new venture right there in Manhattan, so he rented a cinderblock building at 2nd & Osage for $5 a month. Kansas Hide and Wool Company was officially in business. Sam’s only son Jack was 16 years old when his mother sent him to Manhattan to help in the fledgling hide and wool business. After Jack worked that summer of 1933, Sam decided he couldn’t afford to do without him. In between working, Jack managed to complete his senior year of high school in Manhattan and graduated in 1934. Through long hours of very hard work, the company was firmly established by the summer of 1935, and the rest of Sam’s family was able to join him in Manhattan. small manufacturers. When Sam Goldstein died in 1954 from a trucking accident, Jack immediately started moving the business out of hides and furs and into the scrap metal and new steel market. Although their steel volume was still relatively small, in 1959 the corporation name was officially changed to Steel and Pipe Supply Company. The success of Steel and Pipe Supply was built on the dedicated work of countless employees combined with the foresight and influence of its leaders. Founder Sam Goldstein established a strong work ethic and an entrepreneurial spirit. Jack Goldstein focused on building long-term relationships and finding solutions to customers’ problems. Later presidents Paul Van Nostran and Dennis Mullin have each added significantly to the progress of the company. Paul Van Nostran utilized his expertise in the steel industry to build steel mill relationships and move the company to become a full-line prime carbon steel distributor, while Dennis Mullin continued growth and diversification through green-field expansions and acquisitions. After years as Dennis Mullin’s right hand, Matt Crocker seamlessly assumed the role of President of Steel and Pipe Supply in 2014 while Dennis continued in his role as CEO and Chairman of the Board. No one could have predicted that Sam Goldstein’s original $800 would grow into a business generating nearly $1 billion in sales each year, but his philosophy of hard work and service to the customer has stood the test of time. It’s how we still do business today.